And then there was one. Five rounds into the NRL season and we have a single undefeated team left, and it’s been a big week off the field as well. Welcome to The Roar‘s NRL expert tipping for Round 6. While the competition continues to be a close fought one on the field, this week’s focus is off it. The struggling Wests Tigers, who lost again to the St George Illawarra Dragons on the weekend have signed Ivan Cleary, effective immediately while the Canterbury Bulldogs put an end to the speculation and rumours, re-signing Des Hasler. And that was all before Monday was over! Tuesday brought us more news, with Melbourne’s star half Cooper Cronk announcing 2017 would be his last in the south, with a move to Sydney next season. The Penrith Panthers then announced Matt Moylan, Waqa Blake and Peta Hiku would be missing from this week’s game against the Rabbitohs for ‘breaking team protocol’. Wednesday told us Luke Brooks is about to re-sign with the Tigers, while at the same club Mitchell Moses has reportedly asked for a release. Back on the field and there were upsets galore to kick-off Round 5 with the Bulldogs beating the Broncos and the Sea Eagles getting the better of the Roosters in a thriller. Order was maintained for the rest of the weekend with Kieran Foran returning, leading the Warriors to victory over the Titans being the other big moment. Round 6 kicks off with a big match between the Broncos and Roosters with both teams desperate for a win, before the Knights and Bulldogs face off in a game that could either put you to sleep or be a display of two desperate and gritty footy teams. Other highlights will see the competition’s two surprise packets in the Sea Eagles and Dragons go head-to-head at Brookvale – sorry, Lottoland – while Kieran Foran will play his first game against Parramatta on Sunday. It wraps up with the grand final re-match on Sunday between Melbourne and Cronulla. Don’t forget that on the form below, you can put your own tips in on behalf of The Crowd. We will have the results at 5pm (AEDT), so be sure to have them in before then. Broncos. The Roosters lost their first game of the season last week and will lose again on the road here. Bulldogs. Lots of players appear to be suddenly worried about their futures at Belmore, so they could claim a huge win over the Knights. Might get a bit ugly. Rabbitohs. South Sydney are going to love taking on an injury and discipline depleted Panthers side… Seriously Matt Moylan? You’re supposed to be the skipper. Should be close, but Souths to take the two points. Sea Eagles. Gee the Dragons have made me look like a fool this season. At Brookvale though, it’s tough to tip against an in-form Manly side. Raiders. The Titans have been really unlucky this year. They’ve played excellent footy most games but have been cursed by injury. The Raiders may be improving and they have so much strike power so if they hold the ball, it’s the Raiders to win narrowly. Cowboys. North Queensland will win at home, but the Wests Tigers will have some fight with Ivan Cleary at the helm ensuring this one isn’t a blowout. Warriors. And easily as well. Kieran Foran may be the glue the dysfunctional Warriors need to focus and perform. He sure was last week. Storm. Melbourne will win at home in a tough, no quarter given stoush. Roosters. This tip is fraught with danger because the Broncos are going back home after a loss, but they haven’t had many points in them recently. The Roosters have just got to make sure they push the envelope a bit. Bulldogs. Tricky one. The Bulldogs are coming off a determined win in splish-splash conditions against the Broncos, but there’s no guarantee it wasn’t a one-off. The Knights are a threat at home, but I just can’t tip them. Rabbitohs. Huge call by Panthers coach Anthony Griffin to drop Matt Moylan, among others, for disciplinary reasons. Moylan is super-important to them. I’ve got no wrap on the Rabbitohs, but they may just sneak this one. Sea Eagles. Three straight wins over the Cowboys, Bulldogs and Roosters is form comparable to anything in the NRL right now. The Dragons are showing plenty of life themselves, but I’ve got to go with the Sea Eagles at home. Raiders. Canberra are taking time to find themselves this season, but they’re at the stage now where they’re ready to put back-to-back wins together for the first time. The Titans can’t go for anything close to 80 minutes. Cowboys. They’re a weird mob, the Tigers. When they went in against the Dragons last weekend they must have known Ivan Cleary was close to being named coach, so where was the desire to impress him? Eels. They’re better than their three straight losses suggest and they get a decent chance to show that against a Warriors outfit that drifts in and out of games. Corey Norman is overdue a blinder. Maybe it’ll come here. Storm. The Sharks are capable of winning this, but I got my hands burnt tipping the Panthers in Melbourne last week and I’m not ready to take the risk of tipping a visiting team down there again – whoever they might be. Broncos. I’m really looking forward to this game. Although the Roosters should bounce back after last weekend, the Broncos had a tough start to the season and will want to start turning that around. The Roosters could also be missing Dylan Napa. Knights. I love to tip an upset (generally to my detriment). The Knights bounced back strongly last weekend against the Sharks and in front of a Newcastle home crowd, anything is possible. Panthers. The Panthers have been disappointing, but not as disappointing as the Rabbitohs. There aren’t many teams I can see the Bunnies beating in the comp at the moment, so Penrith should win by plenty. Sea Eagles. Who would have picked this to be one of the games of the round 4 weeks ago? The Dragons will be missing Josh Dugan for this game and I just feel like they are due for a loss. Raiders. My prediction for this game is that the Titans will be brave – just not brave enough to beat the in-form Raiders. Cowboys. The only question is, by how many? Eels. I’m tipping the Eels here, just because the thought of losing 4 on the trot frightens me. The Warriors will be tough to beat if they play like they did in the second half last week. The Warriors can always be depended on for inconsistency, so I’m backing the Eels. The Sharks were very disappointing against the Knights last week and I don’t see them being able to compete with the competitions best side at the moment. Roosters. This is an important game. Both need the win for their own separate reasons, but I just don’t think the Broncos have enough points in them to challenge a Roosters side who only lost their first match last weekend. Knights. The Bulldogs might have picked up a win against the Broncos last week, but the Knights are fighting hard and if they can get a good start, they will go on to pick up the win after a spirited effort against Cronulla. Rabbitohs. Just stop and think about this for a moment. No Matt Moylan, Waqa Blake, Peta Hiku, Bryce Cartwright or Tyrone Peachey. That’s a lot of talent to have out and while the Rabbitohs are under strength as well, so this is a risk, but I’m going to tip Souths. Dragons. I backed Manly last week, but not this time around. Dragons at Brookvale without Josh Dugan – seems daunting right? Their forwards have been the catalyst behind the form that sees them in second place and holding the best-attacking record in the competition though, so I’ll go with my heart and back them. Raiders. If the Raiders are going to be premiership contenders, then they can’t afford to lose here. I feel sorry for the Titans, because they are a pleasure to watch – they just fight and fight and fight. There is a never say die attitude in them, but the Raiders should have too much in attack here. Cowboys. I’m not even sure this one needs explaining. The Cowboys are looking solid and with both JT’s on the park, they could rack up a cricket score against a Tigers side who have looked woeful at best. Eels. The Warriors won a game, but it came on the back of a last-minute try against an injury-ravaged Titans. While Kieran Foran was good in his return, they are still unconvincing and the Eels, who have been up and down should leave Auckland with two competition points. Storm. 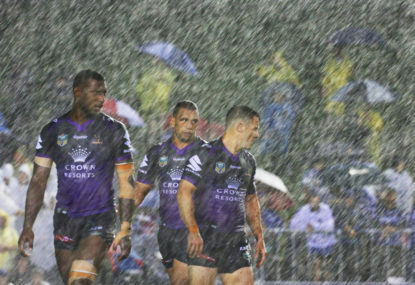 Tough game to pick this – the Storm are due for their first loss of the season, but they haven’t shown any sign of weakness yet, where as Cronulla almost let Newcastle come from behind and beat them last week. Hard to tip against the Storm at home. Now it’s your turn to try and beat the experts. Using the form below, select your tips for the weekend ahead and we will have the results at 4pm (AEDT) this afternoon.